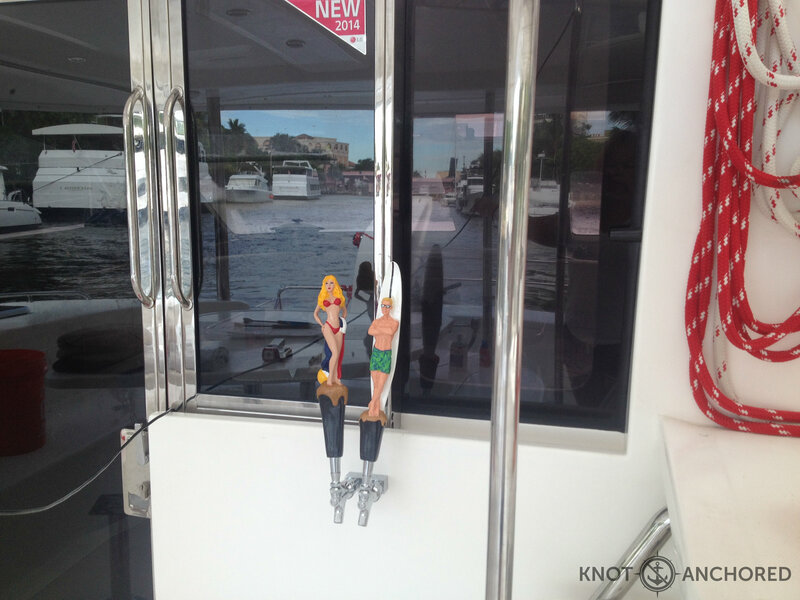 Here’s catamaran Knot Anchored’s newest additions, Beach Babe and Surfer Dude. They’re not just pretty faces, they serve an important purpose…They are our new water taps, but to be honest I see the wheels turning in Stevo’s head and I’m going to say they very well may become beer taps down the not to distant road! But that’s just my prediction! With all the work going on around here, the drilling, sawing, sparks flying trades people coming and going we seem to have brought some attention to our plight by the locals. We’ve met some locals who either live down here on their boats or are just here a lot, including a Head Tattoo artist, the Captain of a 52′ foot Lagoon and his crew and Rick the Bridge Master. It’s nice cause they can appreciate the work we’re putting into this catamaran and I’m sure the entertainment factor is high! Rick the Bridge Master fields calls from oncoming boats too high to pass through without elevating the roadway bridge and lifts the bridge for them. He has the unique perspective of a ‘bird’s eye view’ from 40 ft up. He was our 1st visitor from the area. Came by just to say hey and see what we were up to. It’s nice to meet new interesting people! So with all the new additions comes new needs – new power needs. That’s when Stevo jumps into action. Ok so the original panel is full eh (because we maxed it out)! 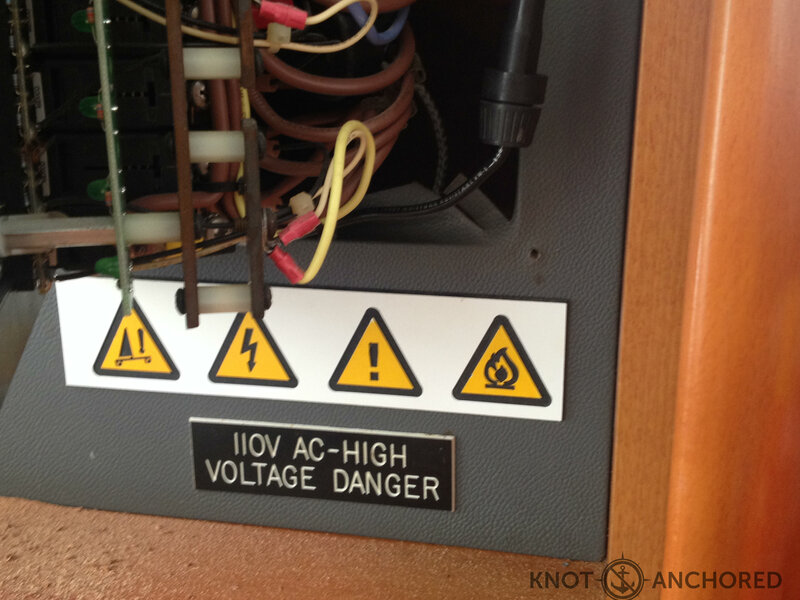 My advice: Please don’t electrocute yourself. I unlike Steve read warning signs! I translate this to: be careful you might get electrocuted. 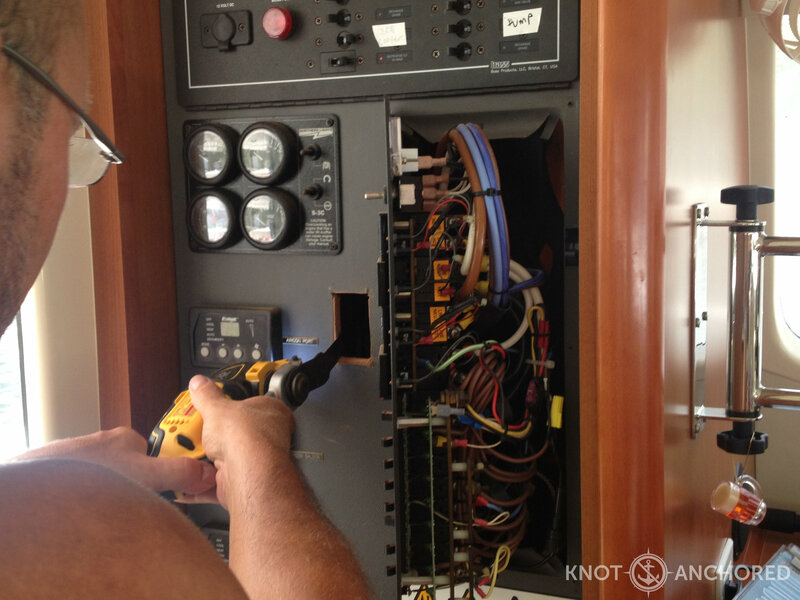 He didn’t get electrocuted of course and now we have more power – looks like we will need to upgrade the generator next hmmm. 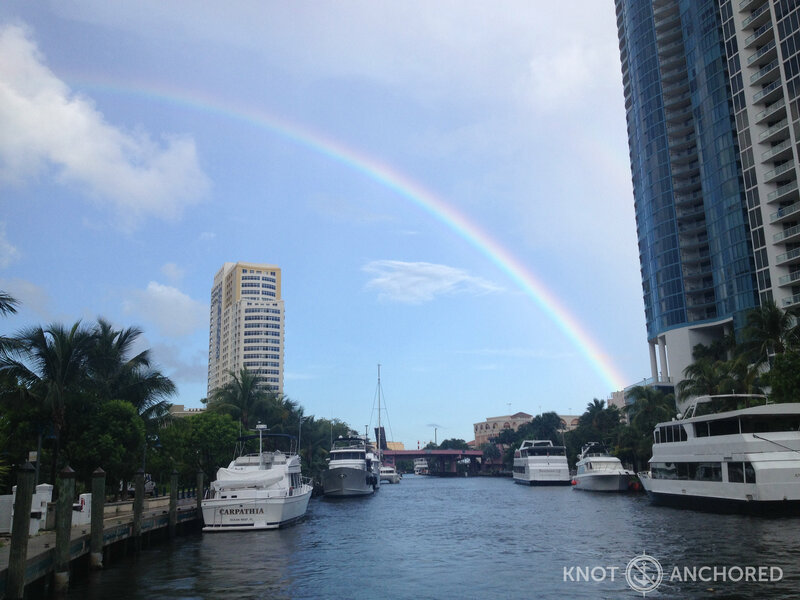 Some day soon you’re going to see this boat docked at the end of this rainbow when all this stuff is finally done! In the midst of all our madness we were lucky enough to get back in touch with our Trini fiends, Amir and Kreshma. Facebook is a great tool for keeping in touch. A quick private message hello turned into a week long reunion. 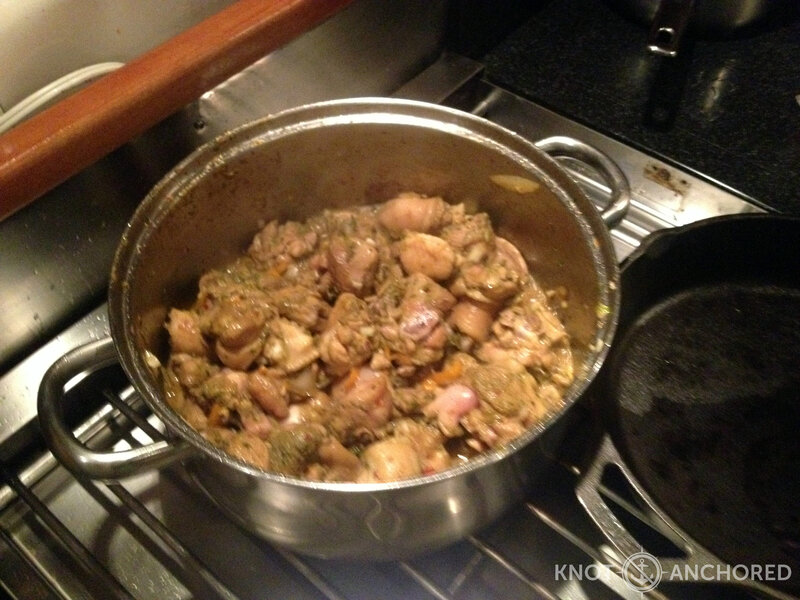 We hung out, learned how to make Caribbean Chicken Stew. 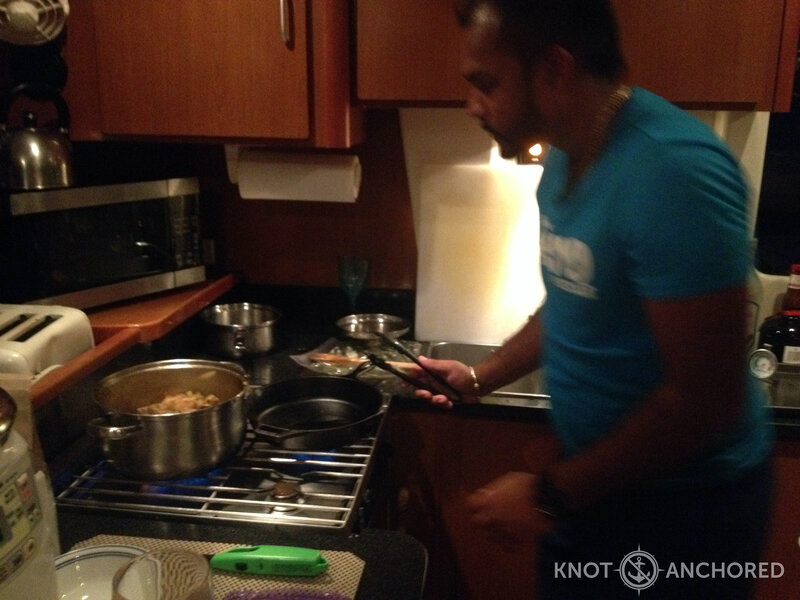 Or should I say watched how it was made, here’s Amir in action. Wish we had a Scratch N’ Sniff blog, this combination of chicken, brown sugar and green spice is impossibly good. Now I can kind of make this, except for one ingredient, shadowbenny which keeps eluding me but I’m told I can make due with Cilantro. Kreshma helped me sort my way through the buffet of comforters and linens at Bed Bath and Beyond. Without her help and style sense I would be posting this from Bed Bath and Beyond. With too many choices for our very weird décor requests – again quality entertainment for the staff at BBB… “you’re looking for what” it would have been overwhelming to do on my own! We couldn’t work the whole time they were here so we came up with the great idea to get off the New River for a bit, go for a cruise and maybe a swim? No shortage of beaches here right? Well the day didn’t quite go like that. Firstly the waves had to be 6ft, not fun and made for a less then enjoyable ‘cruise’ per se. No problem, we changed our plans. Our new plan became touring the Inter Coastal Waterway. The ICW is like cruising through a high end home and garden magazine and being right in someone’s backyard. Just when you think you’ve seen the most amazing home with the sexiest boat around the corner comes something even more impressive. 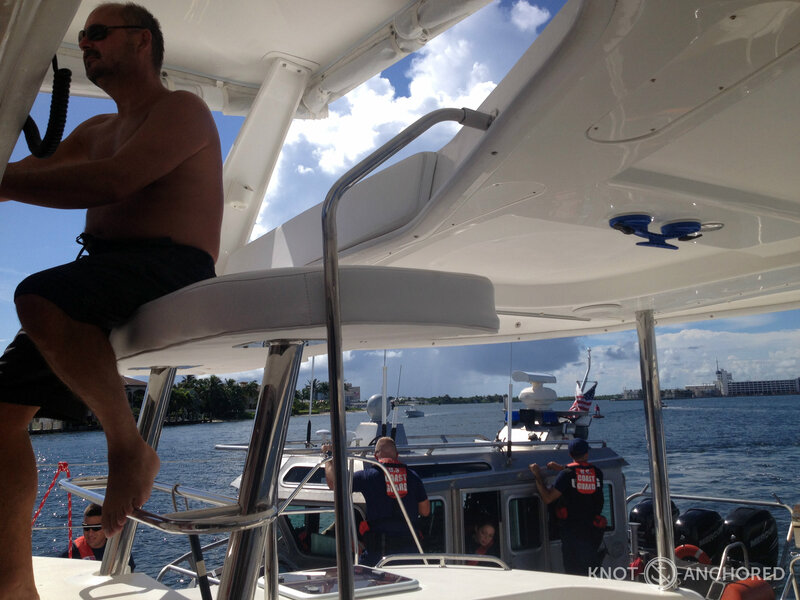 As we returned from our little tour of the rich and famous we got boarded by the US Coast Guard. We’ve read about this and knew it’s a random check that happens and now we’ve experienced it. 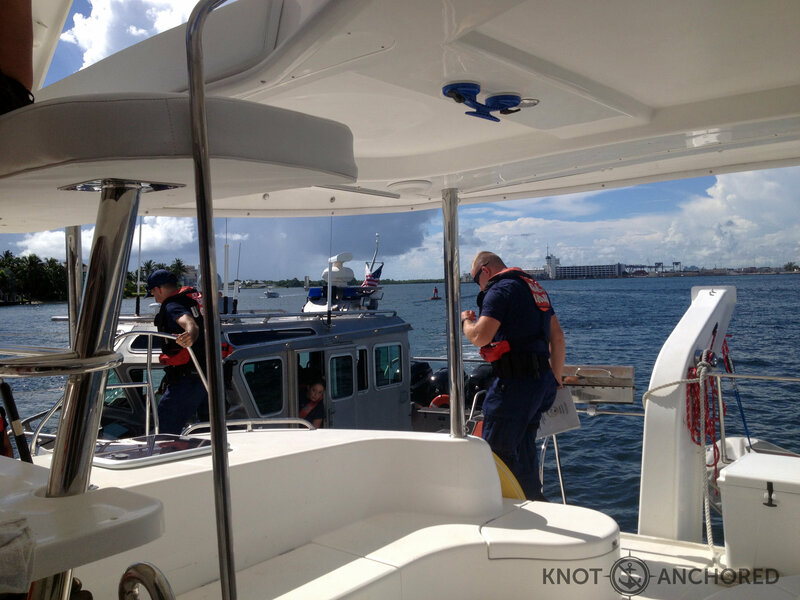 The Coast Guard boat pulls up alongside, ties on and then the guys come aboard. It’s a very formal procedure and you’re not really sure what to expect. Like when you get pulled over in your car and your not supposed to get out you just let the cops approach you. They talked us through it. Were actually really nice. That said I can see how anyone in the midst of any wrong doing would be losing their minds – intimidation factor is high. Not for us – just an experience under our belt! We appreciate the work they do keeping the waters safe as with all personnel who put their lives on the line on a daily basis. Not your average 9 to 5 job! Don,t be cutting too many holes in that boat.But it is nice to put your trade mark on her. Thanks Dad, your right…. drilling holes in a perfectly good boat does not seem right.